Forge Motorsport Boost Hard Pipe - Pann Auto Performance - San Diego largest aftermarket automotive performance parts - What do you drive? 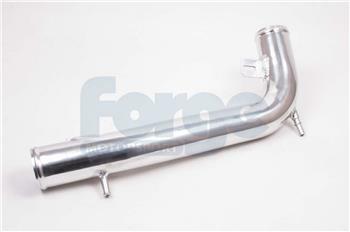 This alloy boost hard pipe replaces the stock plastic/rubber hoses (uses original mounting brackets). The original pipes are very restrictive – the turbo to intercooler pipe is flattened down each side quite severely for no apparent reason. There is plenty of clearance between the block and the chassis for a larger round pipe. The Forge pipe is as big as you can go without the ECU reporting an error. The stock intercooler to throttle body pipe is also restrictive, being ovalised along its length, and manufactured from two pieces glued together making the inside of the pipe non-uniform.